Next, the pine trees around town were suddenly adorning pretty lights! 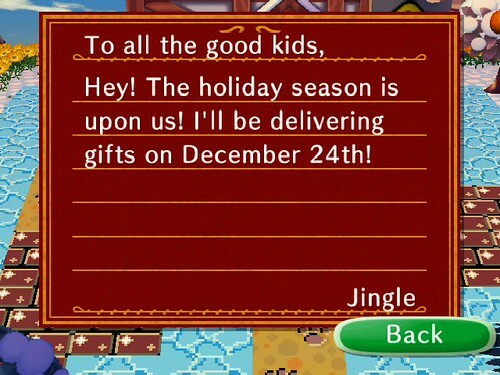 Oh boy, Jingle is coming on the 24th! 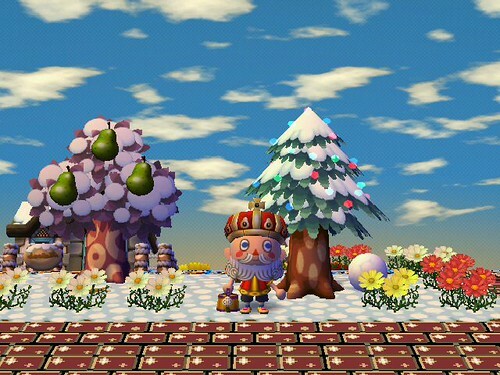 Now keep in mind, “The Night that Jingle Comes to Town” aka Xmas Eve is NOT an easy AC Event! 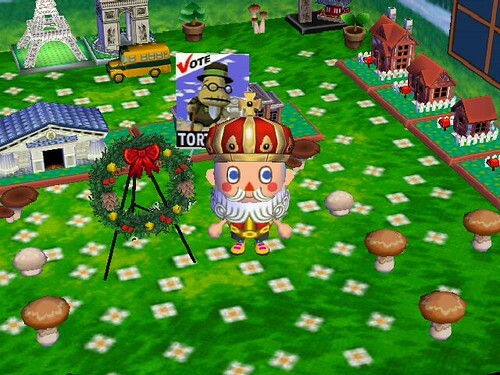 Jingle is a wily reindeer who you must find around town. Here’s the worst part: Jingle can be found INSIDE and OUTSIDE!! AHHH!! You have to go all around your town looking for him. Check in every house that DOES NOT have lights on! (Jingle won’t be inside a house that has the lights on. 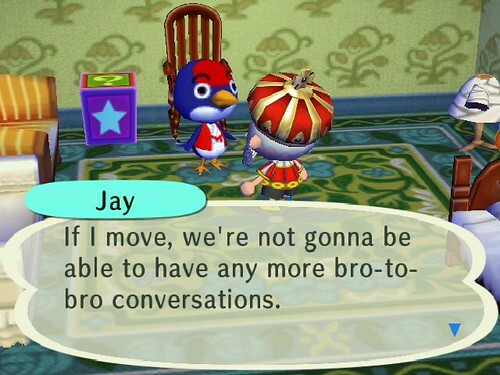 Cuz Jingle only arrives when you ARE ASLEEP… or out of the house, apparently.) Jingle could also be hiding in a regular spot, like behind a house or a tree. And he doesn’t stand still… kinda like Jack on Halloween. Jingle could be roaming ANYWHERE!! But it’s still fun to find him. He’s super cute. I love this cute hat!! I will send out copies to my Japanese friends later tonight when I have more time to play! 🙂 If you’re not in the USA and would like me to send you a cute Snowman Head, please leave a comment and let me know! Now, a bit of [not very] sad news to share: Jay is moving out of Shaolin. Hello my Mysterious friend! Pip here, as always! 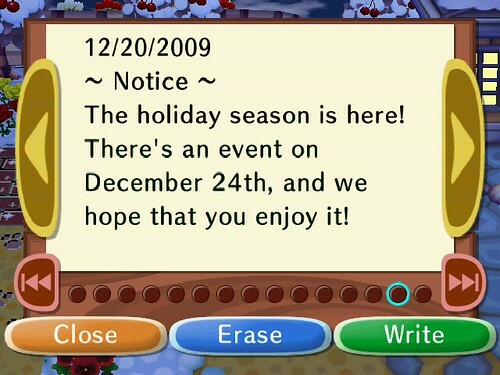 I just wanted to wish everyone playing AC: Wild World a very happy Holiday Season! Everyone in The Shire is excited, we’ve got our Big Festive Tree on display, and I’ve already collected quite a few pieces from the Snowman! All four of us hobbits were able to pitch in and pay off our house loan, so now we have an upstairs room in our home! Most hobbits wouldn’t like to be so high above ground… but we aren’t your usual hobbits, of course. A few nights ago, I saw a shooting star – so I quickly clasped my hands and bowed in respect. 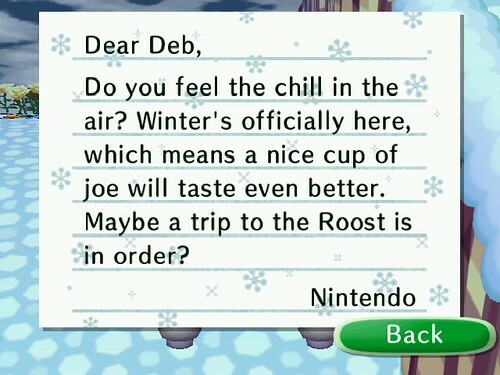 Then the Star sent me a letter with a White Queen attached! I was feeling very lucky indeed! We’ve got some new neighbors in The Shire too – a pony (whom I thought was Old Tom Bombadill’s horse Fatty Lumpkin… but he insisted he is not) named Elmer, a large ape named Boone, a scary looking bull named Rodeo (he gave me his equally frightening photo already!) and a penguin named Friga. 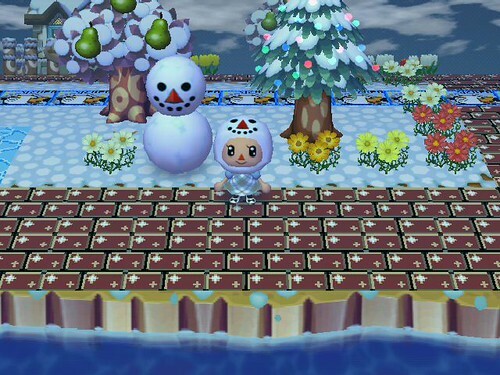 Now I am on the hunt for the Coelacanth… I hope to catch him on a snowy night! Now I’m off to do some holiday shopping (despite Nook’s outrageous prices) so I will write again after the holidays! Seasons Greetings to all!